Corrugated Dump Bin - Floor Standing w/ Custom Printed Graphics! This corrugated dump bin is perfect for holding bulk display items for purchase in any location! The display bins for stores feature custom graphics printed in (2) locations to help both draw attention to the display and inform customers. Different graphics can be used on each section, with stickers digitally printed in full colour to offer a true depiction of your custom designs. The included header has an overall size of 440 x 305mm and can be removed if not necessary for the current promotion. Removing the header makes this stand 870mm tall at the back. This store fixture, corrugated dump bin uses a 280 x 650mm sticker on the front of the stand, with a smaller 280 x 135mm sticker atop the header. The front of the stand is 670mm high, making it easier for visitors to rifle through items in the display container. The interior area has a depth of 95mm from the front of the fixture, and the 302 x 382mm size makes it easy to display a variety of bulk items in this single space. The stand is 1020mm tall when the header is used, with a 305 x 385mm footprint. This fixture is made from 1.6mm thick corrugated with a white gloss laminate finish, providing a great background for graphics and fitting in with any style of décor. The durable stand holds up well to regular use in heavily trafficked areas. This display is shipped flat to keeping shipping costs down, and assembles quickly without any tools necessary, as the sides all fold together. 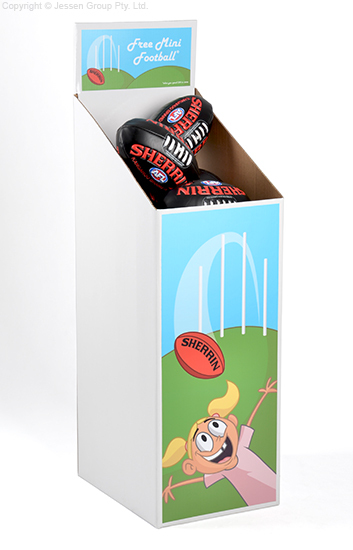 Slimline Warehouse ships fast to anywhere in Australia with any purchase, buy online today to outfit your company with great marketing fixtures!